Any place directly connected to Krishna is spiritually identical to Him and is therefore an ideal place for practicing Bhakti yoga. There are many sites in India where Krishna, during various incarnations, performed activities for all to see. 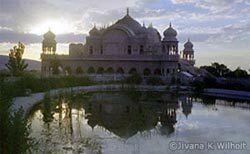 These places have special significance, and chief among them are Vrindavana (Uttar Pradesh), where Krishna Himself appeared, and Mayapur (West Bengal), where Chaitanya Mahaprabhu appeared. The transcendental nature of these places greatly increases the power of the Bhakti practices performed there. Besides that, the atmosphere is surcharged with sights and sounds that invariably remind one of Krishna. And of utmost importance, in holy places one gets the company of pure devotees who can awaken love for Krishna within us. The most elevated devotees, such as the associates of Chaitanya Mahaprabhu, can perceive at holy places the activities of the Lord that are always being enacted on the spiritual plane. Any temple of Lord Krishna, or any other place where He is the focus, is also a holy place. So if we cannot live in a place like Vrindavana or Mayapur, we should make our homes into holy places and regularly visit the Lord's temples—replicas of the spiritual world.